For decades, taxpayer spending on K-12 education has steadily climbed. This stalled during the Great Recession, but it is on the rise again. 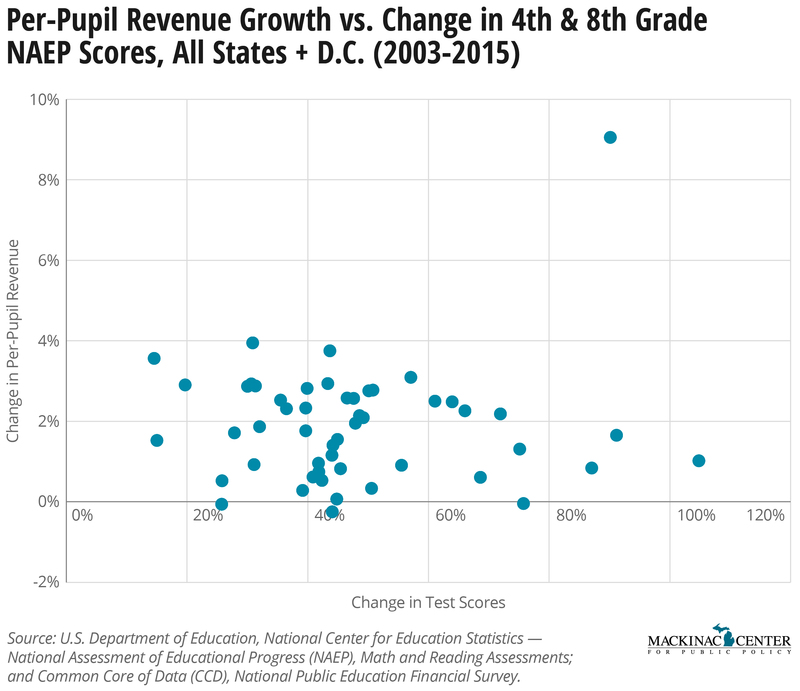 It is often assumed that this additional spending will be good for students, but the data suggest that increased funding by itself has little relationship to student achievement growth. A new report from Michigan State University analyzed long-term education spending trends. The report found that in every state but two — Michigan and West Virginia — education revenue increased from 1995 to 2015. This study criticizes Michigan’s comparative lack of school spending growth. However, adjusting for inflation, student population and considering all sources of revenue, the state’s education spending is at an all-time high. And that is despite one of the worst decade-long state recessions in U.S. history. But there is valuable data in the report. Since it compared states by how much they have increased education spending, it also allows us to compare how those states did when it came to student achievement. The answer? Higher school spending did not appear to translate to more student learning. This isn’t too surprising. A 2016 report analyzing school districts in Michigan found similar results. The analysis tracked years of data of spending by individual schools and compared it to 28 different measures of achievement in these schools. On only one measure did more spending correlate statistically with a better result, but, even then, the gains from extra spending were miniscule. At the national level, the Cato Institute has been tracking these data for a long time, noting that the total cost of the K-12 education system in the United States has skyrocketed — up nearly three times from 1970 in real dollars. Adjusting for the increase in the number of students doesn’t change the trend much. Most of this spending has gone to increasing the number of public school employees. And yet, national test scores — a limited measure, but the best one available — have barely budged. In the meantime, there has been an increasing number of teacher strikes across the country: Los Angeles, Oklahoma, Arizona, West Virginia, Kentucky. The individual complaints of educators may be sincere — many have stagnant pay and benefits — but in every case, taxpayer spending on schools, while declining in the midst of the Great Recession, has recovered to be at or near an all-time high. Educators who don’t see this money getting into their pockets or their classrooms may have an underfunded pension system to blame. That means public school teachers’ real beef should be aimed not at taxpayers but at politicians and school officials who determine how this money is spent. Still, the strikes are misplaced because of one larger truth — taxpayers are spending an increasing amount of money on education and still appear not to be getting a good return on this investment. For many teachers’ unions, with a tweak on a saying from UCLA football coach Red Sanders: “Money isn’t everything; it’s the only thing.” That may be true for them, but continually increasing money for schools doesn’t seem to be achieving what taxpayers want.